French nuclear giant Areva was solely responsible for a controversial $320m (£250m) uranium deal, a parliamentary investigation in Niger has said. The 2011 deal, known as “uranium-gate”, involved companies in Niger and abroad. Activists have begun legal proceedings. It caused an uproar after a local paper said it had served as cover for officials to embezzle public funds. The report did not find any evidence of wrongdoing by any officials. Areva says it cannot comment on the report. The French company says it has not yet received the report. It has previously said it was co-operating with a French investigation into the case. 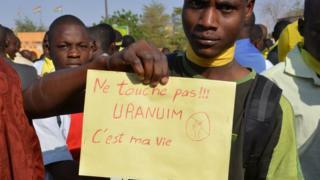 Niger is one of the world’s biggest uranium producers and the metal is the country’s largest export. BBC Africa Live: More on this and other news updates. Opposition parties say the report has been botched and lacks integrity. They say that two of their lawmakers who were part of the group which led the inquiry were not associated in drafting the document. Last month, activists in Niger started legal action into the deal, saying they feared the parliamentary investigation would lead to a whitewash. Their complaint alleges embezzlement of public funds, money laundering, forgery and conspiracy to defraud. The on-going legal action centres on the allegation that Areva in 2011 bought a stock of uranium from Niger at a discounted price, causing the national treasury to lose money. Areva used the transaction to provide funds requested by Niger to secure uranium sites in the north against militant attacks, the report said. Niger’s uranium mines are located in the Sahel region south of the Sahara Desert, an area where Islamist groups such as a local branch of al-Qaeda are active. The report said that Finance Minister Hassoumi Massoudou had been involved as a mandated “representative” of Sopamin to facilitate the transfer of the requested funds. A separate French enquiry has been looking into the “uranium-gate” allegations as part of a wider investigation into Areva’s business dealings. A spokesperson for the nuclear giant told the BBC the company maintains that the 2011 transaction was a “trading operation”. “We have not seen the report and cannot comment on it,” the spokesperson added. Niger has two significant uranium mines that provide 7.5% of the world mining output from Africa’s highest-grade uranium ores, according to the World Nuclear Association, the international organisation that represents the global nuclear industry. Niger’s first commercial uranium mine began operating in 1971, with a strong government support for expanding uranium mining.